Heckler & Koch® HK45 Compact V1 .45 ACP Semi-automatic Handgun. The concealed carry alternative to the proven full-size HK45. In terms of quality, components and technology, it's functionally identical to its "big brother" but in a much more carry-friendly size. And, just like its full-size counterpart, it combines the accuracy, modularity, reliability and 20,000-round service life of the famed USP45 series with the improved ergonomics of the P2000 series pistols... and the results are as exceptional as you would expect. Capable of firing everything from standard .45 ACP ball through +P ammunition, the HK45 Compact has an 8-round magazine capacity but can also use 10-round magazines, including those designed for the full-size HK45. If you love the HK45 but need a pistol you can carry every day, look no further. 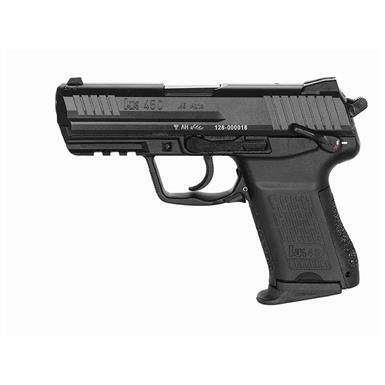 Heckler Koch HK45 Compact V1, Semi-automatic, .45 ACP, 8+1 (will also accept 10-rd. mags) is rated 5.0 out of 5 by 1. Rated 5 out of 5 by Frank from Quality, accuracy and price! Although the HK45C has been around for awhile, it still proves to be among the best and most reliable. After acquiring, shooting and carrying an HK9SK, I decided a 45 cal had to be my next purchase. SG had a great price, fast shipping and a four pay plan that I couldn't pas up. Add a couple 10 round mags and you're good to go at the range.